Neve 33609, Other software dynamics processor from Universal Audio in the UAD Plug-In series. loudfunk's review"Super flexible compressor/limiter plug-in"
Rock solid under either OSX or Windows. 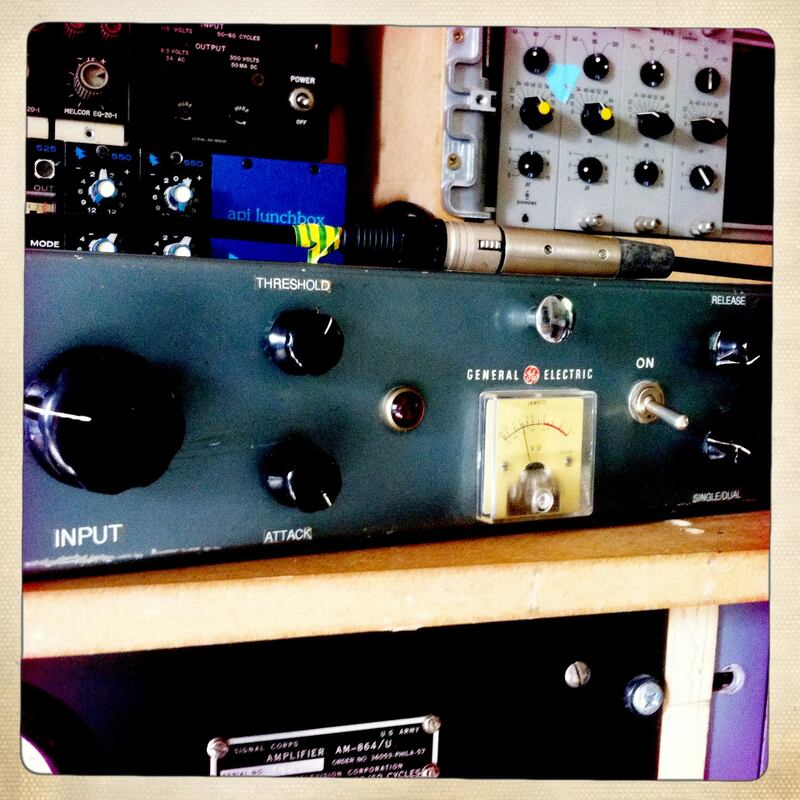 Derived from the original Neve 2254 compressor, circa 1969, the 33609 stereo bus compressor/limiter utilizes a bridged-diode gain reduction circuit and many custom transformers. The uniquely musical character of this circuit made the 33609 a studio standard since its release. The UAD Neve 33609 is the only Neve-sanctioned software recreation of the Neve 33609 (revision C). Every detail of the original unit is captured, and matches its hardware counterpart with absolute precision. The 33609 plug-in includes a DSP-opti- mized 33609SE which allows for higher instance counts. The completely step-controlled 33609 is made up of separate compression and limiter sections, each with their own threshold, recovery and bypass con- trols. Two of the recovery selections for each section are dedicated to a pro- gram dependent auto release. The compressor section also offers five ratio se- lections and 20 dB make-up gain, while the limiter offers a fast or slow attack. The mono/stereo switch couples and decouples the left and right gain reduc- tion elements. 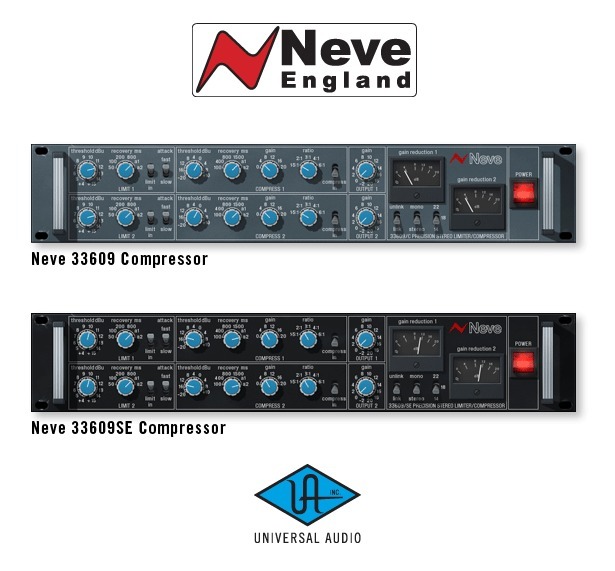 The UAD Powered Plug-In version of the Neve 33609 adds a few control en- hancements not found on the hardware: An additional stepped output control with 20 dB of gain, a link switch allowing ganged left/right control of all pa- rameters, and a headroom switch, which allows the DAW user to take advan- tage of the full range of 33609 gain coloration. 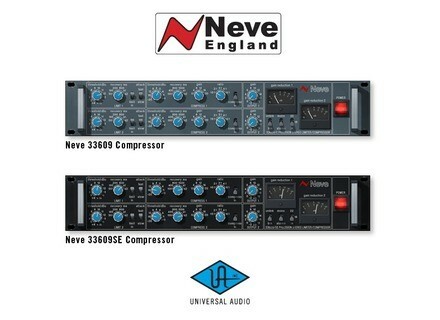 The UAD Neve 33609 is a two-channel device capable of running in stereo or dual-mono modes. The active mode is determined by the mono/stereo switch. ericthegreat's review"stable software no crashes"
I run Neve 33 609 with a Mac Book Pro that has a 2.2 Ghz Intel Core 2 Duo processor and 4 GB of RAM. I use it with Pro Tools LE 7.4 and a Digi002R. I have never run it with anything else as I'm pretty sure you can't run it with any other software because it is a Digidesign plug-in that comes free with Pro Tools. I am able to run a bunch of these at once without any problems and I have never had a problem with it whatsoever - this plug-in with my configuration is completely stable. I've been using this since I got Pro Tools, which was about three or fours years ago. The sound of this compressor is good and usable, but since I have other options like Smack and a URS compressor, I don't use it all that often. The sound quality is good but is definitely not spectacular. The meters and graphs are a big upside on this as they are quite helpful. The interface is easy to follow and even those with no previous use with a compressor should be able how to us this. I like it on drums and guitars and I probably wouldn't use it for anything else, as the tone isn't vibrant enough for my taste. It is easy to follow though and since the price is free with Pro Tools, you can't really complain about it at all and it is nice to have as an option. The install is nickel, has no problem with my signpost UAD-1! It is fast and efficient! The plug runs perfectly, do not crash in Nuendo 3, however, it is quite CPU intensive attention! FYI, 4 times that plug into a UAD-1 and c is the overload! A plug really terrible, a sound very close to the hardware version (that is to say the quality of compression). So my favorite soft compressor I think! I love his sound design that faithfully reproduces the machine, its clean interface, presets really well done. I tried tons of compressors in the app before that (Waves, URS, Sonnox ...), I found that it really has its place among my top, and what is more versatile! Beware though, and I think that it was the default, you need a good DSP card to run it (UAD-2 advised in my opinion).